Around the world in 90 days! Traditionally, a Bucket List records aspirational trips to unexplored destinations. Chartered client, Jeunesse Park, took a different route – literally – on her recent travels: she made her Bucket List all about seeing people who mean so much to her. Traditionally, a Bucket List records aspirational trips to unexplored destinations. 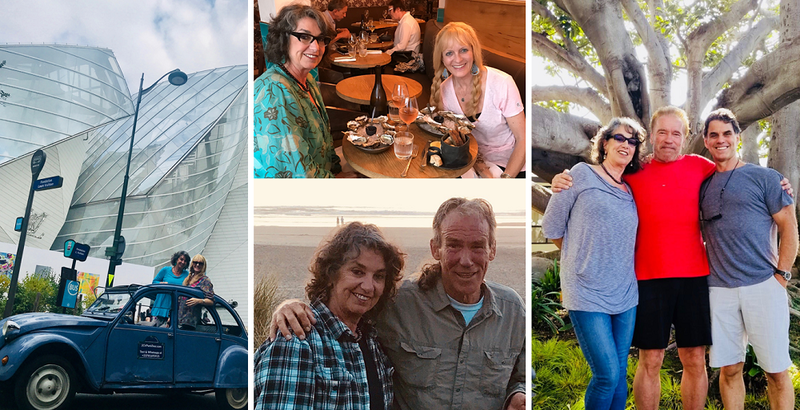 Chartered client, Jeunesse Park, took a different route – literally – on her recent travels: she made her Bucket List all about seeing people who mean so much to her. Here is Jeunesse’s account of her epic journey to connect with special people in her life. Be inspired! I realised that, having worked so hard all my life, I had left little space for enjoying family and friendships. In recent years, I have lost my parents, my life partner and, in 2018, my close childhood friend and another two friends died. Other friends and family were facing transitions, and some were feeling a bit adrift, even depressed. 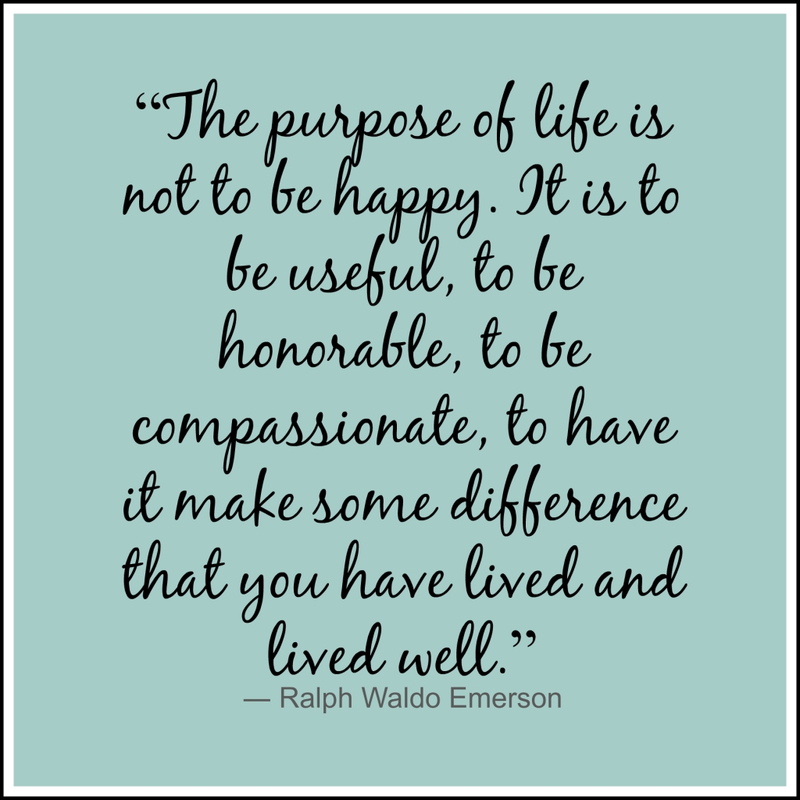 I decided to live life to the full while I can still walk, talk and think for myself, to revisit people I care deeply for and places I have lived. To finance my trip, I used money I earned running my family home (all children moved out years ago) as a BnB for four years. I bought a round-the-world trip, not more expensive than flying return to the furthest spot on the planet. Jeunesse’s epic trip included beautiful places and memorable experiences. Here is a brief travelogue. My first stop was London, beautiful in the summertime, where I visited a cousin I have loved since we were tiny girls. We now work together on a Bushman project that is close to our hearts. Together, off we went to Paris to drink wine, eat oysters, walk kilometres daily, chatter and laugh a lot. The following destination was not my favourite, but it was where (it turns out) I was needed. My brother in Los Angeles needed input on some family issues. I always love seeing him and hope I helped. A dear friend, the first ever Mexican Ambassador to South Africa who studied his Masters in the ‘greening’ of Mexico City via UNISA, invited me to visit Mexico City. He had translated my ‘Greening Booklet’ and distributed it to a million Mexican schools. I was delighted to stay with him and his wife and explore wonderful museums and galleries. The terrible pollution, and seeing my friend suffering from asthma, was disturbing, though. 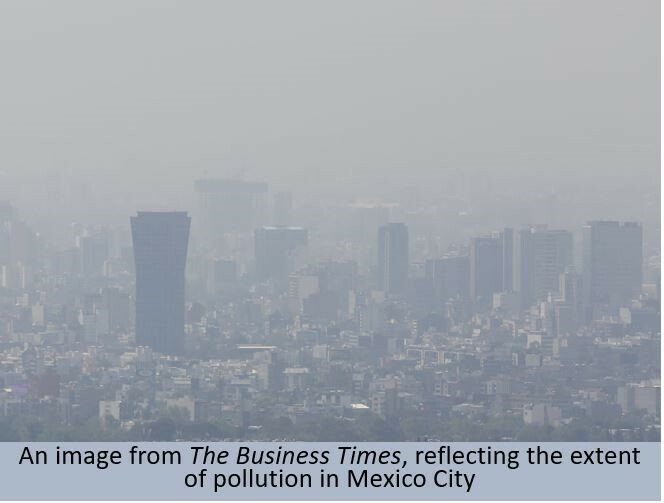 Like Cape Town, Mexico City is drying up and he introduced me to top water people in government. Some may join us in May 2019 at the W12 Congress in Cape Town for the first 12 major world cities running out of water. Back in the USA, I spent 10 days with my ex-husband. Forty years ago we had travelled across the country in a camper van. We had planned to camp in Yosemite National Park and for us then to drive north to Seattle, but the park was closed owing to raging fires. The North-West Pacific, full of beautiful natural places where I am most happy, was besieged by fires and choking smoke. This was truly, as the Plume app* describes it, an airpocalypse. We did find some lovely places to camp along the magnificent coast and engaged in fiery climate change, political and philosophical discussion en route. Our marriage had ended badly. This time, we resolved much: with time to chat, we heard each other’s side of the story and agreed that we are friends forever. My next sojourn, beautiful Seattle, USA, where I had visited my uncle four years before while on a climate training with Al Gore. Back then I believed it was the last time I would see him, so was excited to celebrate his 90th birthday with him. He is quite deaf and succumbing to Alzheimer’s, though remembers his youth. He quipped, “I may be losing my mind and my hearing, but not my sense of humour!” We giggled and reminisced. My next stopover was the garden island of Kauai, Hawaii, but climate change beleaguered me there, too. I had booked a small AirBnB between a beach and a river. On arrival, flood warnings greeted me as a hurricane approached. I relocated to a hotel, the hurricane was downgraded to a tropical storm and my beautiful Californian niece joined me for a week of hiking, cycling and swimming. I next went to Sydney, Australia to connect with a great environmentalist friend and some family. I cruised the magnificent harbour with a young cousin and her new baby, swam in Byron Bay, where the water is so clear that I could see the flash of fish swimming around me, and walked McMasters Beach with another young pregnant cousin. I visited relatives who had just lost their son and spent some time hugging trees on his birthday in his favourite spot at the Melbourne Botanical Gardens. His bereft mother, who had not ceased weeping, smiled for the first time. Such is the healing power in nature and in bonding with it and each other. Finally, I stopped off in Bali for a week. My friend, Solar Marc, took me on his motor bike to visit an eco-village. We wore masks to filter out the terrible air pollution and though the seas were cleaner than when I was last there, the island is tragically nothing like the exquisite paradise I lived in in the 1970s. Jeunesse undertook a People Bucket List trip, to connect with her special people across the globe. I highly recommend such a relationship Bucket List. I was on my own, but was never lonely. My most memorable moments were those spent with people and in nature. Many I stayed with said that I brought good energy and joy into their homes which, along with the feeling of closing circles of life, made this a most fulfilling trip. I was present in each moment and really appreciated people in my life. Though I visited places I had lived before, I did not reminisce so much as reflect on who I had been then, who I am now, and how I can consciously live the rest of my life. Our Retirementor, Jeunesse Park, has shown herself, through her writings, to have diverse interests – all directed to conservation and preservation. In her article, Jeunesse explains why saving an ancient culture is saving ourselves. I recently joined an exceptional initiative that supports the continued survival of some of the earliest humans; they have the oldest DNA and are the last integrated hunter-gatherer community with a deep knowledge of the earth, plants and environment. Through my work in this field, and as a human who hopes for a better future for our species, I feel strongly that helping these indigenous people, whose connection to Earth is ancient and valuable, can teach us so much. Save the San recognises Khoisan people as the original inhabitants of Southern Africa. The Ju/’hoansi San, or Bushmen, of the Nyae Nyae Conservancy in Namibia, are the final integrated San community allowed to hunt and gather for their survival. Sadly, they are extremely vulnerable, largely owing to an exceptionally low level of education: only 1% complete high school and none attend university! This remote Nyae Nyae region has extremely inadequate school facilities that are hostile and alien to the community. Taken away from their families to attend school in another language, the Ju/’hoansi children are often confronted by wild animals as they walk long distances to school, and once there are bullied and intimidated. They have no transport and there is little access to building materials, school supplies, blankets, basic foods and support. Over the last 11 years, Save the San has consulted and researched with this community, which realises the only way to preserve their identity and sustain their culture is through mother tongue education and skills, taught in early years, to survive in the modern world. We are already training eight San teachers and the project will provide transport and water tank trailers, as well as support food gardens to enhance school attendance and the ability to learn. Save the San will cover salaries for matrons, janitors and other staff and the Ministry of Education will pay the teachers. We now need support and partners. 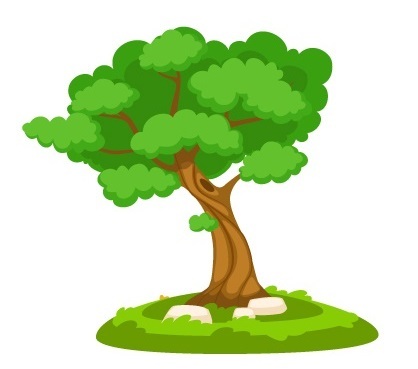 If you can contribute materially, or through helpful connections, contact jpark@progreen.co.za. Breath is central to life. Breathing is where our energy to live comes from and when we stop doing it … our time is over. Do you ever think about what we are breathing? Did you know that we are being exposed daily to dangerous levels of air pollution with significant impacts on our health and wellbeing? 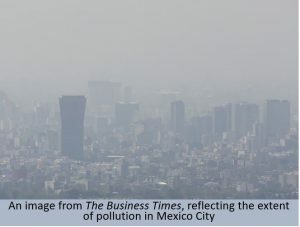 Yes, here in South Africa, particularly on the Highveld, air quality is often hazardous. I know because I now check an air quality App (called Plume) as often as I do the weather. This journey of knowledge started for me in July when I visited family along the spectacular Northwest Pacific, USA. Our planned drive from Los Angeles to Seattle through national parks and conservation areas soon became an apocalyptic nightmare. After San Francisco the skies grew grey; it was not cloud, but smoke. The atmosphere became increasingly oppressive, our eyes were stinging, and we were almost choking. By this time, I was no longer trying to see the barely visible landscape but trawling the internet for local fire updates and downloading an air quality App to find where the air might clear. We drove through a summer inferno. Temperatures soared and the air was heavy from hundreds of fires burning from California to Canada. It was a horrifying experience. Exhausted from the stress of the trip through so much smoke, we spent a night in a cheap motel in Oregon – no camping out, and grateful for the air conditioner. I have a newfound appreciation for quality air conditioners where the filters are regularly changed. Despite their energy usage (which I learned is greatly reduced), they can filter air pollutants. We abandoned plans to visit Yosemite, closed due to the fires anyway, and joined thousands of holiday travelers on the busy coastal highway where most campsites were full, but where we could breathe easier. The week at my uncle’s beautiful home on Hood Canal near Seattle was overshadowed by severe smoke from the 500 fires burning in Canada. Citizens, especially the elderly, young and ill, were warned to stay indoors. Usually visible daily, I could not see the Olympia Mountains across the water, though the smoky sunsets were vivid. Sadly, this is just the beginning of more searing summers to come as climate change ravages the planet and the air we breathe becomes more and more polluted. Oh, and on my return to Joburg in September, hoping to breathe freely again, the App indicated an Airpocalypse, the worst it could be, with most days since registering extremely high pollution. Retirementor, Jeunesse Park, shares her involvement with an organisation which has innovative ideas to reduce the impact of the Cape Town water crisis on the quality of education and the well-being of our children. This article serves as both warning and inspiration – work together and we can mitigate the effects of climate change. After years of dreaming about living in Cape Town, I finally moved there just as it became one of the first major cities in the world to be running out of water. Frustrated that the government was slow to act, I was delighted to be contacted by a new non-profit organisation, Save our Schools (SOS), who have some innovative ideas. They were introduced to me through my work with Al Gore and the Climate Reality Project and I joined them on World Water Day in March 2018. In response to the negative impact water shortages have on sport and hygiene at schools, SOS has grown into a multi stakeholder network providing innovative water solutions for those in need. The hard-working SOS founders have achieved remarkable results in just one year, thanks to collaborative and dynamic partnerships. Swish Properties was a first responder, providing non-potable water from the hundreds of thousands of litres they daily pump out of the basement of one of their properties. 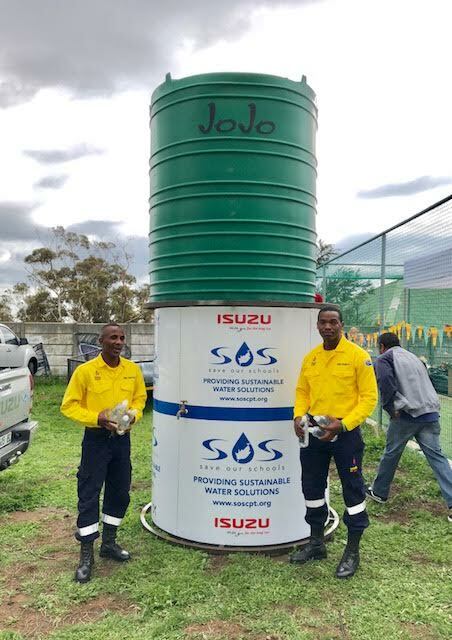 Isuzu constructed and has equipped SOS with 10 water tankers to transport tanks and water, as well as providing vehicles to facilitate the work. 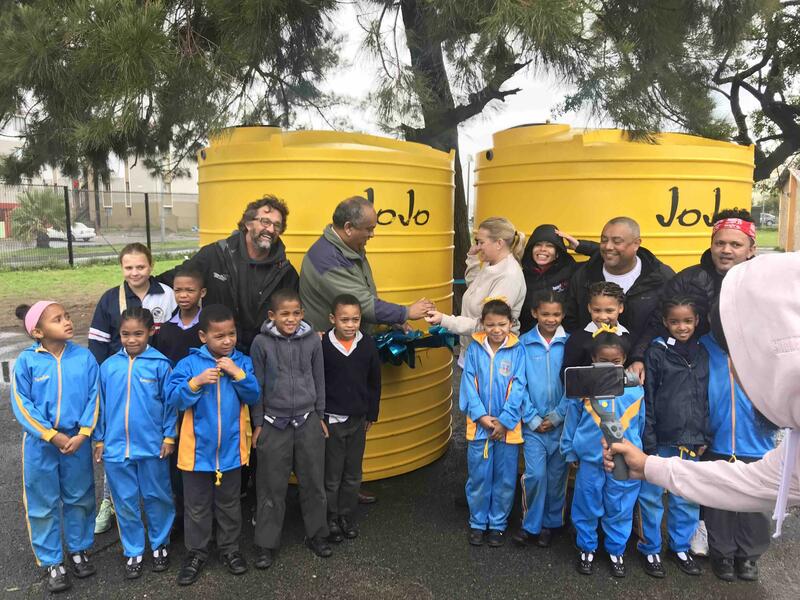 JoJo Tanks provides schools with water storage tanks and pump manufacturers Grundfos installs booster pumps and sets for SOS projects. Unilever donated an additional 35 water tanks and contributed to awareness events. Insurers Munich Re provided thousands of litres of bottled drinking water for schools and communities and Mountain Falls Spring Water has created a special SOS bottled water. The SOS team now includes a pool of internationally influential climate leaders, government and media partners, successful multinational companies, entrepreneurs, education and development leaders, engineers, water specialists and more. Projects start with the delivery of water and the associated infrastructure to those in need and are buoyed by awareness, education and enterprise development initiatives. Whilst the winter rains finally arrived in Cape Town, restrictions are still in place and climate scientists, water experts, insurance companies, activists and others warn that this is only the beginning. Climate change will continue to wreak havoc on world weather. The dire impacts of the water restrictions on the economy, tourism, agriculture and much else that contributes to our quality of life in Cape Town and South Africa, are already being realised. We need to work together to build water resilient communities. Failing future – Are we out of time? Retire Successfully Retirementor, Jeunesse Park, writes to us from Los Angeles, having spent a week in Mexico City. There, she says, the pollution is so extreme, that her eyes burned unrelentingly, and she felt like she had been a long-term smoker. 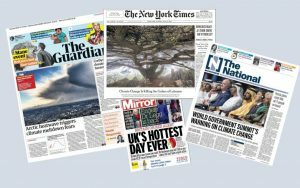 Jeunesse expresses her frustration at the seeming inaction of the powerful and influential to promote climate change, but she is heartened by the growing exposure given by such mainstream media as The New York Times, The Guardian, The Post and others. They are finally sounding climate alarms loudly and continuously. It is 2018 and we are living in a new climate reality. Extreme heat, drought, fires and floods ravage the planet. Access to drinking water shrinks and agricultural production falls. Hundreds die, thousands are displaced and millions of lives are shattered. The physical effects are disastrous. The economic impacts are still to be calculated, comprehended and will play out over decades. One thing we do know … anthropogenic climate disruption is here to stay. We have warmed the earth by only one degree centigrade since the Industrial Revolution and the results are already catastrophic. Scientists are pretty sure that if we stay on this current fossil fuel trajectory we are on a path to a two to five degree warming. Permanent drought in parts of the world, fires, more intense weather, hurricanes, floods, heatstroke, starvation and associated disease and suffering will soon become the norm. At four to five degrees our species will falter, fall, and fail. How have we let it come to this? Warnings have been sounded since the 1950s (some even earlier at the turn of the century) that our rampant fossil fuel consumption and concomitant emissions were a dangerous experiment with earth’s atmosphere. Most scientific debate – on how our spewing out of excessive carbon was altering life on this planet – was settled by 1980. Further conclusive research papers have since been published, and hot air has been blown out at many global conferences. Those of us who have realised the danger of inaction have exhorted world leaders, big business and citizens to rally. We have had every opportunity to act, but we have not. Instead, we now disgorge more noxious greenhouse gases daily than ever before. We are a shortsighted species, unable to grapple with the consequences of our actions and their threat to our future. We are obsessed with gratification in the present and seemingly have no ability to learn from our mistakes and change direction. So, business continues as usual whilst millions suffer and our very survival is threatened. Explaining our inaction to our children and grandchildren is more than challenging. Trying to instil hope that we can defy an inevitable dystopian future is overwhelming. Yet, hope we must. I am not giving up. I will continue to communicate what I witness and understand, to draw on my knowledge and experience to facilitate change and action where I can. This year of climate disasters has hit mainstream media worldwide and awareness is growing. Young people are collaborating and challenging the justice, or rather injustice, system. The surge of technological solutions is encouraging. My hope is in our essential human resilience and innovation. I have never considered myself wealthy but feel blessed every day and grateful to have enough to eat. Yet, I live with an innate sense of the injustice and inequality of our society, which drove me to devote most of my working life to the non-profit sector, focusing on uplifting lives through greening and food. My parents instilled this. When I was five, living in Italy, we daily passed the slums in Rome where my mother pointed to the children eating out of dustbins. 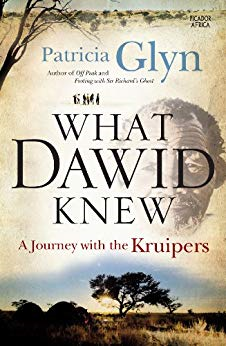 A few years later we resettled in South Africa and on trips to townships where my father promoted health and fitness, the inequity was all too apparent. A sobering read of Stats SA’s findings and a new World Bank report highlight that over 30 million in this country still live in poverty. These reports show South Africa as one of the most unequal countries in the world, and worsening due to low economic growth, high unemployment and a failed education system. Stats SA’s data indicates how lack of education traps people in poverty. In 2015 they reported 79.2% of individuals with no formal education are poor, compared to only 8.4% who have a post-matric qualification. One wonders why the nation doesn’t spend more on quality education and educators. It should come as no surprise that children are most vulnerable to poverty. Poor children from poverty-stricken households can’t eat properly, cannot grow well and, even if they do get to school, will perform badly. It is a no-brainer that we need good nutrition to foster cognitive ability, the foundation of learning. Bearing the brunt of unemployed parents, children graduate from poverty into being unemployed youth. What kind of future do they have? And how does their desperation affect all society? The upper and lower-bound poverty lines look at the cost of basic food and other basic living needs like shelter, clothing and transportation and are currently R758 (40% of our population live there) and R1 138 per month respectively. The food poverty line represents the amount of money that a person needs to purchase enough food to consume around 2,100 calories per day, the minimum daily energy requirement for someone living in an emergency situation. I Googled what this look like and found an array of fad diets for weight loss showing images of muesli, fresh fruit, tuna salads, nuts, lean chicken, quinoa and even a glass of wine. How do you do that living on less than R1 000 a month? There is much more to say on poverty but hopefully this short piece gives food for thought. How can you contribute and drive change? 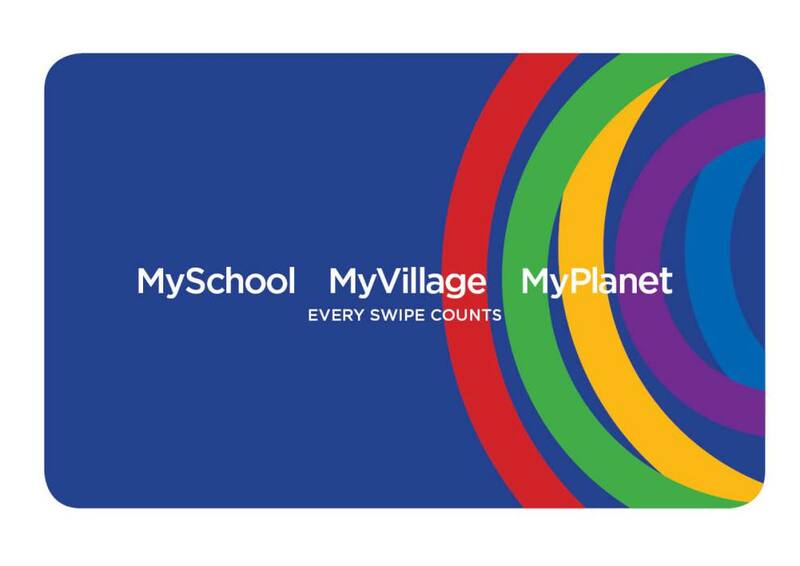 At the very least you can contribute through your shopping – www.myschool.co.za and https://dischem.co.za/dischem-foundation – offer the opportunity to contribute to worthy causes seamlessly. At this time in my life, I live alone in a small but comfortable space. I try to keep my life footprint as small as possible, understanding our disastrous impact on the planet and the dire future our descendants face as a result of humanity’s excesses. only driving when it’s too far to walk, too heavy to carry or transporting a grandchild. My children think I am weird, but all this gives me deep satisfaction and even a great sense of achievement. The one area that has confounded me in my quest for low impact living of late is the necessity to eat a few times every day. In winter, I often cook up a big pot of a favorite soup or stew to eat over several days and freeze when it gets tedious. Plant pots on windowsills offer a few herbs and vegetables but after a lifetime of providing daily meals for many, I now have little desire to cook. On a lighter note, I have found that I can forage successfully from my daughter’s fridge. They do not always eat their leftovers nor keep a close watch on what is about to be past its use-by date. This can expediently give me several meals a week. In the interests of health and diversity though, I have been wondering lately about the impacts of cooking for one, ordering in or eating out. None of the sites I have found factor in the true costs of these options. Most are sure that preparing meals at home is cheaper, but they do not include the drive to and from the shops, disposing of the packaging and other waste, the gas or electric energy required to cook a meal, the water to clean and wash up, as well as the time that could be spent on other things. What I have started to do since I live within a short walk of shops is to buy only enough for a day or two at most. In this way, there is no waste and I am doing my bit in reducing the one-third of food produced globally that is wasted. More research on this is obviously required and will be shared in future posts. Meantime, I would be glad to hear from you. Being able to say, “I told you so” is not gratifying. In fact, it is profoundly disturbing. For the past few years I have been warning all who would listen that we are heading for the day when you switch on your tap and nothing comes out. Sometime towards the end of last year “Day Zero” for Cape Town was announced. Now I feel like I am living in the dystopian future I spent most of my life trying to avoid through my work and activism. Living in a city drying up has added a pervasive level of stress to daily life. It is immensely frustrating that Government still refuses to learn from or take offers of help from cities like Singapore and Perth, or Israel (a country of water expertise) that have successfully solved similar water supply and demand issues. Aside from the criminal lack of response from the Department of Water Affairs and others purportedly in charge of caring for our water and wellbeing, no one can deny that the climate has changed. Wild weather is the new norm. Disasters related to droughts, floods, and other extreme weather events now occur globally. A UN study indicates an average of 335 weather-related disasters occurred annually between 2005 and 2014, nearly double those recorded from 1985 to 1995. Yet here, as the water tumult grows, there is a nervous avoidance of references to climate change. It is a fact that as air warms it expands, which allows it to hold more moisture. This, in turn, increases evaporation and precipitation, which generally makes dry areas drier and wet areas wetter. We live in a water-scarce country here at the southern tip of Africa, and, sadly, as predicted by climate science for decades, this intense drought is just the beginning. Threats of ill health, anarchy and army-controlled queues of millions attempting to get their daily 25 litre allowance and lug it back home have resulted in a sea of social media offering response strategies. Unfortunately, emotions run high and there is much disinformation. Bottled water, water saving devices, containers and tanks have disappeared from shelves as a result of panic buying. Aggressive behaviour in queues for spring water and supermarket aisles is already common. 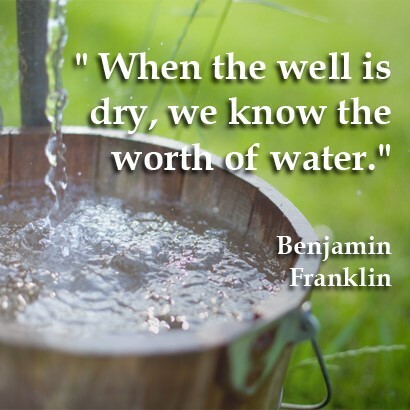 A positive consequence of an impending Day Zero is that most citizens have woken up to the fact that water is a precious and necessary resource. On the promenade, in bus queues, coffee shops, dinner table conversations, in shebeens, in countless informal discussions and in global media, water talk dominates. Morbid jokes like the proposed new tourism ad, “Come to Cape Town for a dirty weekend” also abound. As a nation we have survived apartheid and seriously awful governance in recent years. We are a resilient people and this existential water crisis could bring out the best in us. Cape Town could lead the way for the other eleven global cities on the brink of running out of water. Let us rise to the challenge. Retire Successfully Retirementor, Jeunesse Park, asks us to imagine life without trees. The fact is there wouldn’t be life. We evolved thanks to the oxygen boost from green plants through the awesome process of photosynthesis. We have a deep-rooted connection with trees, the longest living organisms and one of the planet’s greatest resources, yet we have eliminated 80% of our world’s forests, and continue destroying a football field size of forest every 2 seconds, at our peril. Deforestation and forest degradation make up 17% of world carbon emissions (more than the entire world’s transportation sector), intensifying climate disruption and the dystopian future we are hurtling towards. What about the 70% of world’s plants and animals that live in forests and are losing their habitats, leading to species extinction? Besides being a biodiversity tragedy, we are losing vital medicines we don’t yet know exist. September is Arbor Month in South Africa, and whilst trees should inspire us daily, it is a time to focus on these life-giving wonders that we rely on, but often take for granted. City trees give relief from heat islands and save money spent on storm water management. Studies continually show that there are many more health, sociological, psychological and economic reasons we need trees to thrive. It has been proved that patients looking out onto trees healed faster and required less medication than those whose outlook was concrete. Another study that looked at the health and social benefits of urban forestry showed how living in green suburbs helped to mitigate crime, respiratory diseases and even teenage pregnancy. There is no excuse not to plant more trees. India recently broke its own world record with 1.5 million volunteers planting 66 million trees in just 12 hours! Imagine: pineapples, vineyards and millions of trees growing in the desert … and a million litres of effluent and factory wastewater – both purified – irrigating the crops of the future. These are a few of the wonders I saw on my recent visit to Israel. 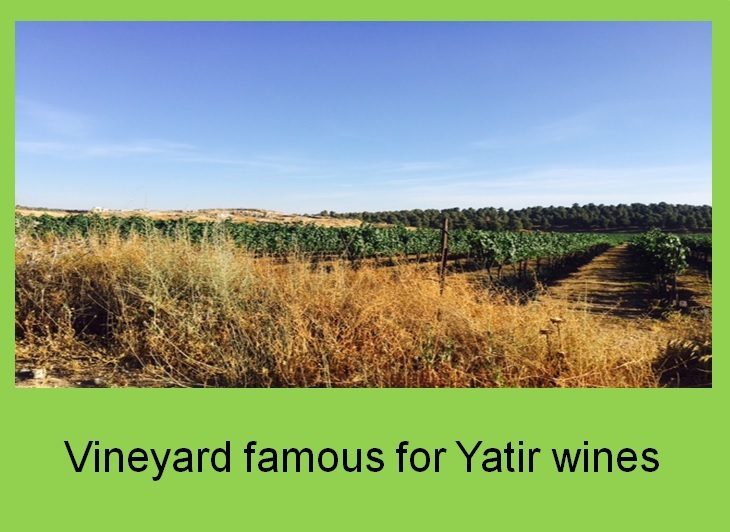 Deep concern about climate change and the current water crisis in the Western Cape drove me to explore a few examples of Israel’s achievements in the Negev desert. It was mind-blowing. I last visited Israel 26 years ago when Food & Trees for Africa (FTFA) began. 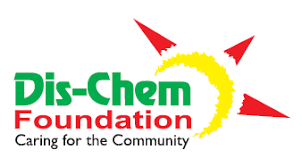 The Jewish National Fund of SA was the first to show interest in FTFA, an organisation created from a vision of a healthier, greener, more food secure and climate resilient South Africa. They arranged a two-week study tour for our founding board members to meet experts in trees and forestry, water management, agriculture and soil. Israel’s solutions-driven innovation and implementation astounded and inspired us then and is even more relevant today. 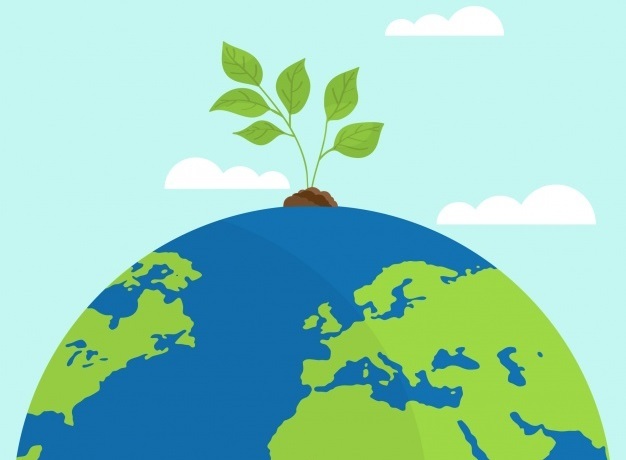 In a country where land, water, arable soil and fossil fuels are scarce, foresight and clever technology, based on sound research, have created models of sustainability that other countries strive for – enough resources to sustain healthy lifestyles and economies, and, in some instances, abundance. Israel leads the world with 80% water reuse. Water is successfully produced and harvested through desalination, biofilters and remarkably efficient management of wastewater. Quality water is delivered to all residents, farmers, industry and business, with excess provided to Jordan and the Palestinian Authorities. The Sderot Resevoir was built (under missile fire) from a pragmatic vision to address drought in the southern Negev. It purifies for reuse all effluent from Sderot, a town of 26 000 inhabitants, and wastewater from their factories and farms. 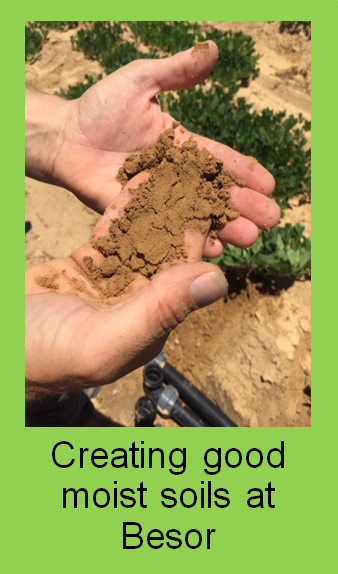 Besor Research and Development Centre’s work with local farmers is resulting in better crops for export and local use, in healthier soils, using minimal, and often even saline, water. 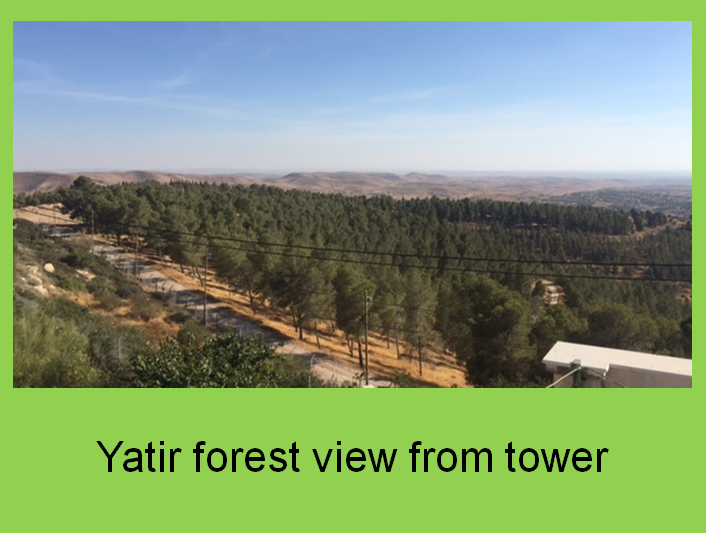 Charts around the old tower over the forest of Yatir show recorded rainfall rising annually from the first planting – which aimed to combat desertification in the 1960s – and as more trees were planted and grew. This initiative is an inspiration to FTFA’s initial greening and climate-change work, as today, this green forest of over 4 million trees is spectacular. Be-er Sheva, a model city, shows how nature should be embraced in urban development. It is an example of pioneering urban planning that integrates natural capital. Landscaping for aesthetics and resource management enhance attractive, well-designed suburbs. Trees line the streets, providing much-needed shade and recreation areas. 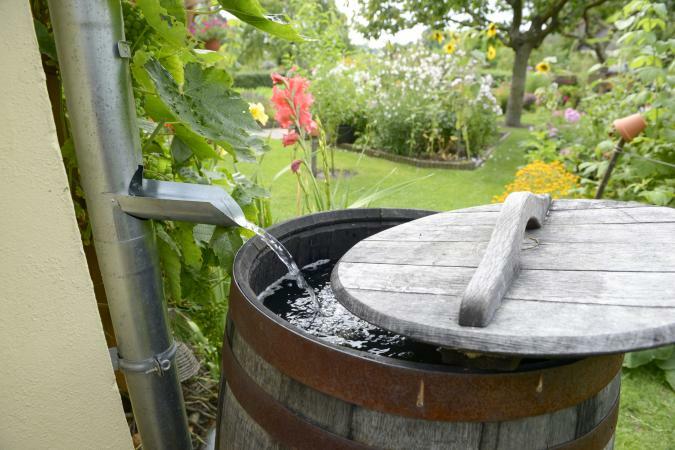 They help to slow and clean water run off, as well as cleaning the air and absorbing greenhouse gas carbon dioxide. There is much to learn from Israel’s green tech and innovation and they are willing to share. Replicating projects like these few I was privileged to see could greatly improve South African lives. The Western Cape, in drought and predicted to face a seriously dry future, would benefit immensely from these world water leaders. We should have implemented these measures decades ago … but now is the next best time.